Knopf publicity bigwig Paul Bogaards kindly plunked us onto his Hierarchy of Book Publishing: The Top 100. We’d note that we’re run out of basements throughout the NY-metro area (and not just NJ), but we’re too busy telling the Stieg Larsson estate to eat our dust. 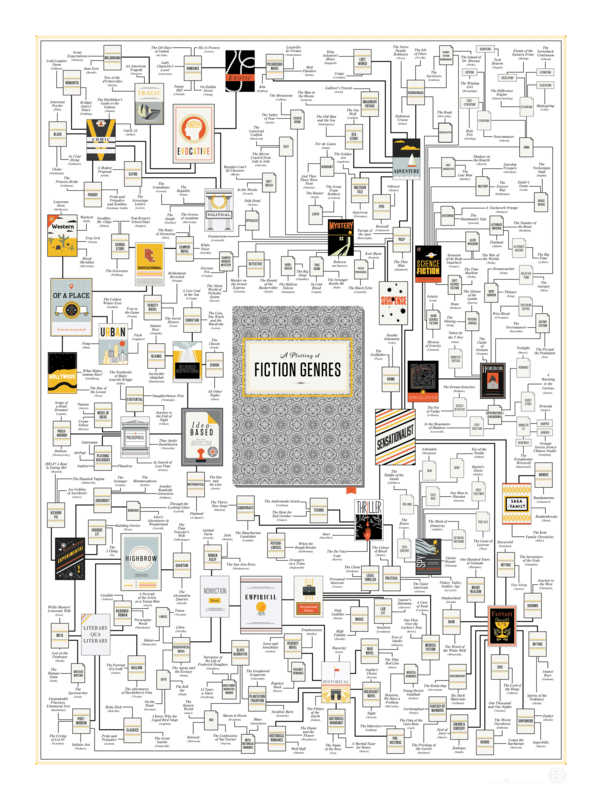 This week in book-related infographics: “A Plotting of Fiction Genres” from Electric Lit. “Your opponents would love you to believe that it’s hopeless, that you have no power, that there’s no reason to act, that you can’t win. Hope is a gift you don’t have to surrender, a power you don’t have to throw away.” This seems a better time than most to revisit Rebecca Solnit‘s Hope in the Dark, an excerpt of which ran in The Guardian earlier this year. You can also read our review of Solnit’s The Faraway Nearby here.